All-honorable fathers, honorable monastics, dear brother and sisters! 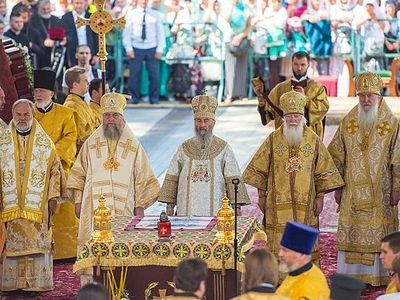 The Baptism of Rus’ opened a new period in the history of our people. The light of the faith of Christ changed the spiritual, moral, public, and state life of Kievan Rus’. Our forebears came to know the true God, Whose commandments transformed their pagan customs. One of the most topical consequences of the acceptance of faith in the one true God was the strengthening of unity in ancient Russian society between the tribes that were part of the Kievan state. The foundation of this unity was the Metropolitanate of Kiev, whose lawful and rightful successor is the Ukrainian Orthodox Church. 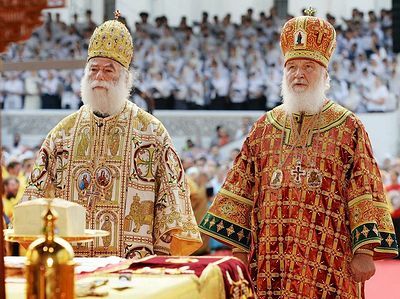 It is no exaggeration to say that it was precisely the Orthodox faith and Orthodox Church that formulated the soul of our people and stimulated the development of our statehood. Today our Church faces many challenges. For the past several months, the debate about the possibility of granting a tomos of autocephaly has not subsided. We attest that the canonical status our Church has at present is wholly sufficient for it to fruitfully carry out its mission among our people. Attempts to change this status lead only to the restriction of the rights and freedoms with which our Church is endowed, having the rights of broad autonomy. Moreover, these attempts will not cure but only deepen the division both in Ukrainian Orthodoxy and in Ukrainian society. This also applies to the possible creation of a parallel Church jurisdiction in Ukraine. At the same time, we are witnessing the attempts of external forces to turn the Church into a component of geopolitics, ideology, and state security, which is openly stated in the public space. Such statements and such attempts are of concern to us as they are contrary to the calling of the Church. 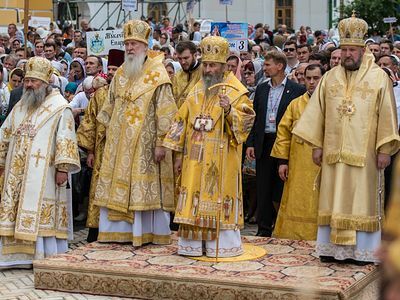 The Ukrainian Orthodox Church speaks in defense of the canonical foundations of its existence and of its faithful who are frequently demonized and driven out of churches and in defense of its internal ecclesiastical freedom from the interference of political forces. We are convinced that the Church of Christ should not be an instrument in the hands of any state or political ideology, wherever it comes from. Indeed, the Lord Jesus Christ founded His Church not to serve the interests of the Roman Empire, under which He was born, completed His saving mission, died and resurrected. The Lord founded His Church for the salvation of human souls. However, that does not mean that the Church should be detached from the people and the urgent problems experienced by real people, society, or the state. 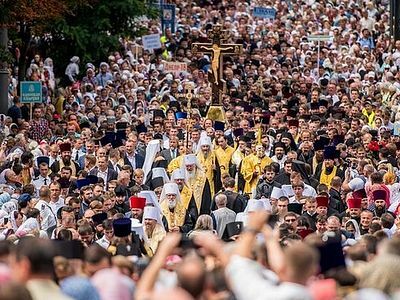 The Ukrainian Orthodox Church nurtures true patriotism in people—that is, love for God, for neighbor, and for the Fatherland. Only such patriotism can be a healthy foundation for the establishment of the state. We regret the fact that the leaders of the Church schism use the authorities today to justify and legalize their sin against the Church. It’s regrettable that their destructive activity and constant media attacks and slander against the Church lead to that which the apostle Peter warned about: By reason of whom the way of truth shall be evil spoken of (2 Pet. 2:2). As a result, many people who could have come to the bosom of the Church do not come because they are seduced by such activities. We hope that those who do so will come to understand the consequences of their actions and cease harming the Church of Christ. We also appeal to all the clergy of the Ukrainian Orthodox Church. Dear fathers and brothers! The unity of our Church directly depends on us! We are tasked to feed the Church of God, which He hath purchased with His own blood (Acts 20:28). Our ministry is not in preaching some culture or political ideas. If some secular ideology penetrates into the Church and destroys its unity then our task is to resist this in word and deed and to preach to people not this or that earthly ideology, but Christ, Who stretched out His hands upon the Cross to unite all. The Church exists to unite, not divide people. Thus, I beseech you, brethren, by the name of our Lord Jesus Christ, that ye all speak the same thing, and that there be no divisions among you; but that ye be perfectly joined together in the same mind and in the same judgment (1 Cor. 1:10). Brother and sisters! You are not alone in your trials. Our whole Church now prays, empathizes, helps, and will continue to pray, empathize, and help you. Your sufferings and your pain arouse pain in our hearts. According to the apostle Paul, whether one member suffer, all the members suffer with it (1 Cor. 12:26). We express our gratitude to the archpastors, pastors, monastics, and all laity of that part of Donbass where the flames of war blaze, for your courage, for remaining with your flock, for patiently bearing the trials that have befallen you. We pray to the All-Merciful God and we believe that the war will soon come to an end and that God shall wipe away all tears from [your] eyes (Rev. 21:4). Celebrating the anniversary of the birth of our people in Christ, we should not only remember the past and speak about the present, but think about the future. The main calling of the Church of Christ in every age is the fulfillment of the Savior’s commandments: Go ye therefore, and teach all nations, baptizing them in the name of the Father, and of the Son, and of the Holy Spirit (Mt. 28:19). Bearing the Word of God to people who do not live the life in Christ, even being baptized, is our first and constant task. Preaching among people who are as yet far from Christ, missions among the youth, and dialogue with the intelligentsia, people who doubt in the faith, unbelievers, and generally with all strata of our people is all the content of the mission of the Church in modern society. Social activity—helping the poor and destitute, immigrants, and all people suffering from the war in eastern Ukraine—is an incarnation of the Christian love that the Lord awaits from every believer. Therefore, in the conditions of the challenges that face the Church today, we must labor ever more diligently in the spiritual field, for, according to the holy apostle Paul, Now is the accepted time; behold, now is the day of salvation (2 Cor. 6:2). On the day of this great anniversary—the 1,030th anniversary of the Baptism of Kievan Rus’—we offer prayerful gratitude and praise to the glorious God in Trinity—the Father, and the Son, and the Holy Spirit—for the gift of Baptism. 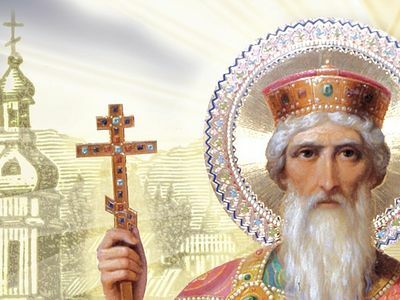 We pray that the Lord would grant us to be worthy successors to the spiritual work of the holy Equal-to-the-Apostles Grand Prince Vladimir, to preserve the holy Orthodox faith, and to embody it in works of love, mercy, and peace! May God’s blessing be with us all! 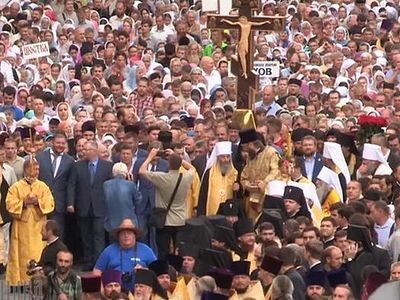 About 250,000 faithful Orthodox Christians from Ukraine, Russia, Belarus, Moldova, Romania and elsewhere have gathered in Kiev today for the celebration of the 1,030th anniversary of the Baptism of Rus’. May God grant Metropolitan Onuphry many years and may the reunification of the Ukraine and Belarus with the Russian Fatherland soon be achieved.